Gold is the metal of kings, the ultimate money, an eternal store of value, an untarnishable embodiment of beauty. Gold is all those things. But it is not the most valuable metal you can own on a cost-per-ounce basis. Often, platinum commands a higher price than gold. Lately, platinum has traded at an abnormally large discount to the yellow metal. Metals investors who want to hold the most concentrated wealth in a single ounce bullion product should opt not for gold or platinum…but for a different platinum group metal called rhodium. Rhodium is scarce and thinly traded. Frankly, it’s a little-known metal even among metals investors. Like platinum and palladium, the primary application for rhodium is catalytic converters for cars and trucks. It is alloyed with platinum and palladium to enhance resistance to corrosion. Rhodium is also used in some types of jewelry. Rhodium has quietly been in a raging bull market over the past couple years. Prices bottomed out in 2016 at around $600/oz. This September, they surged to over $2,400/oz and have remained there. As impressive as that quadrupling is, rhodium still trades far below its all-time high from 10 years ago. From 2004 to 2008, rhodium launched from $500 to as high as $10,000/oz. At its current value of $2,425/oz, the niche metal still has lots of room to run. Of course, the trade off associated with rhodium’s explosive price potential is that it also carries significant downside risk. This metal isn’t for the faint of heart. Folks just getting started in precious metals investing should first build up core holdings in gold and silver. But more seasoned hard assets investors who want to add a high-risk/high-reward speculative component to their precious metals portfolio might consider rhodium. The high-flying metal is currently available to investors in the form of one-ounce bullion bars. They come sealed and authenticated by either of the reputable mints Baird & Company or PAMP Suisse. More options are available for the more popular catalytic metals, platinum and palladium. Bars, privately minted rounds, and even some sovereign coins are available to investors. Platinum currently sells at a discount of more than $350 to gold and a discount of nearly $250 to palladium. That’s unusual historically on both fronts. 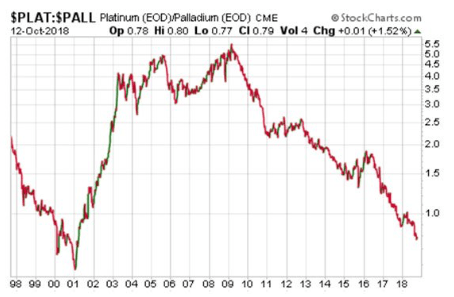 In fact, the platinum:palladium ratio, which came in at over 5:1 as recently as 2009, slid below 0.8:1 this October – its lowest point since 2001! Platinum’s large discount incentivizes industrial users of palladium (mainly automakers) to begin substituting in platinum where feasible. Platinum has generally been favored by diesel engine manufacturers, while palladium has increasingly been preferred for conventional gasoline vehicles. Ever since the Volkswagen diesel emissions cheating scandal, diesel car manufacturing has been in a bear market – bringing down demand for platinum as a side effect. Whether platinum prices have finally bottomed out remains to be seen. Platinum won’t stay down forever, though. Its next bull market could be driven by a comeback for diesel, substitution by palladium users, a supply shortfall, or some combination of these fundamentals. Most platinum comes from South Africa, a country now ruled by a land-grabbing, asset-seizing government. Due in part to political risk and in part to adverse market conditions, many South African mines have scaled down operations or closed this year. Total annual platinum supply of 8 million ounces still meets demand, but that dynamic could change by next year. In the months ahead, supply destruction could lead to a deficit in the platinum market. Given the dire situation in the South African mining industry, supply will difficult to ramp up again when it’s needed. Contrarian metals investors are positioning themselves in platinum at current levels with the expectation that when the market turns, prices could run higher for years to come. At the very least, a bet on platinum again becoming more expensive than palladium... and again more expensive than gold, seems likely to pay off eventually. It always has before whenever platinum got anywhere near as depressed as it is today. Money Metals Exchange and its staff do not act as personal investment advisors for any specific individual. Nor do we advocate the purchase or sale of any regulated security listed on any exchange for any specific individual. Readers and customers should be aware that, although our track record is excellent, investment markets have inherent risks and there can be no guarantee of future profits. Likewise, our past performance does not assure the same future. You are responsible for your investment decisions, and they should be made in consultation with your own advisors. By purchasing through Money Metals, you understand our company not responsible for any losses caused by your investment decisions, nor do we have any claim to any market gains you may enjoy. This Website is provided “as is,” and Money Metals disclaims all warranties (express or implied) and any and all responsibility or liability for the accuracy, legality, reliability, or availability of any content on the Website.